One of the many benefits of having excellent posture is the ability to enjoy an active lifestyle without injury. Conversely, an active lifestyle can help cultivate good posture. While you are still honing your posture, water is a perfect medium to train in since your buoyancy will reduce impact on your joints. In this forgiving medium, you can safely increase your muscle strength, stamina and flexibility while exploring the nuances of natural posture. You can reset movement patterns and connect the dots that make up the Gokhale Method while enjoying the soothing effect of the water on your body and mind. No matter which stroke you choose, you will have occasion to summon up and strengthen your deep abdominal muscles. These muscles are especially important for the health and safety of your spine. The internal obliques keep the front of the ribcage flush with the contour of your torso. This “rib anchor” is our best defense against swaying the back. The breaststroke (and butterfly, if you are able) are perfect opportunities to strengthen your rib anchor. In these strokes, there is a strong tendency to arch or sway your back every time you come up for air. Next time you attempt the breaststroke or butterfly, try to come up with your entire upper body, just enough to breathe, without a sway. Your lumbosacral juncture will gain flexibility and your internal obliques will get a challenging workout. get a substantial workout in backstroke. Asymmetric motions are a great way to strengthen both the internal and external oblique abdominal muscles. When you twist or rotate your body to the right, the external oblique muscles on your left side work together with the internal oblique muscle on your left. The left external oblique muscle rotates your left side forward as the right internal oblique rotates your right side back. Conversely, when you twist to the left, the right external obliques and left internal obliques are engaged. 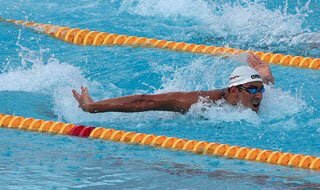 The arm and leg motions involved in both the crawl and backstroke have a tendency to twist or otherwise distort the torso. If you engage the external and internal obliques appropriately during each stroke, you will tone your obliques as they work to dampen this twisting effect. The result is that the entire body twists rather than just a piece of it. Even if you are conscientiously using your obliques for all three of these strokes, vigorous swimming will include some distortion. To really protect your spine, use your Inner Corset to keep your elongated J-Spine intact. This will have a dual action, protecting the spinal element during your workout, as well as strengthening your deeper back and ab muscles. 4. Keep the back of your neck long and your chin down. As you begin to move, imagine yourself walking regally with a basket on your head, or using your legs as poles to punt a boat along a canal. Enjoy the healing weight of the water. It slows you down, giving you time to become aware of nuances in your gait. Snowlion, I attended a class at my local gym on a regular basis for about 2 months before I really felt that my back had improved; I began to wake up in the morning WITHOUT a backache. However, I am 73 so if you are a younger person you surely would get better much sooner. I guess I'm encouraging you to be patient and keep at it! I have been needing an article like this since 2005, when I stopped aqua exercise in order to address a back injury. THANK YOU for enabling me to get back in the water - 9 years later - now with a stable core - this coming week-end!